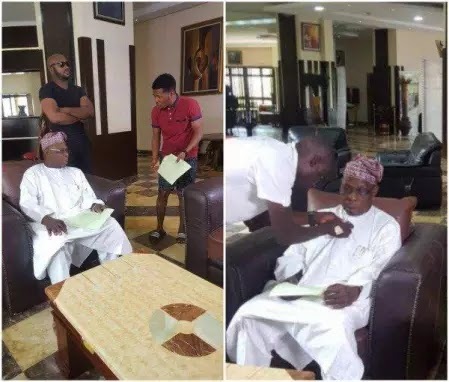 Nollywood actor and ‘The Johnson’s’ star, Samuel Ajibola shared behind-the-scene photos from the scene of a comedy skit which features the former president of Nigeria, Olusegun Obasanjo. “I’ve had this picture for Months, but I’ve been looking at this Picture for the past 3 days, knowing I was going to post it up this Morning but not knowing what to write under it as a Caption. Then I woke up this Morning and the first song that came to me was “you raised me up so I can stand on mountains, you raised me up to walk on stormy seas, I am strong when I’m on your shoulders, you raise me up to more than I can be” And then I got it! This is it! What I’ve been looking for? My caption would revolve around the Grace of God. ‘To start with, Who am I? That on my very own first project as a Producer (I’m talking about the Dele Issues nonsense I’ve been disturbing you guys with every time on social media..lol) , that I would have the privilege of having a Former president of my Country (Chief Olusegun Obasanjo) feature in my own skit because of an idea I just conceived in my mind once? I meant, as at the time I thought of this idea I thought I was just being crazy, but then again I remembered a quote I’ve seen some time ago that says ” your dreams are not Big if they don’t scare you”.All I did thereafter was to chase this dream and I left everything to God’s hands. Now I can confidently say that on the 14th of October on my YouTube channel ( just search “Samuel Ajibola TV” and you will see it) I would be posting the #Deleissues(special edition) skit by 12 pm’. ‘If there is any advice I can give you young guys out there, it is this. ”Please don’t be ever scared to chase your dreams that came from any crazy idea you’ve ever thought of in your head.